Debates about whether Russia was better off in Soviet times are left behind as Vladimir Putin focuses on his country’s future. President Vladimir Putin’s first address to the Federal Assembly since his return to the presidency outlined his vision for the future of Russia. He spoke of morality, Russia’s geopolitical relevance, the importance of education for the country’s development, demographics and the need for economic “restructuring”, a word that has replaced the out-of-vogue “modernisation”. He also emphasised the importance of looking at the country’s entire history rather than only the 20th century, saying: “Russia did not begin in 1917, or even 1991”; of resisting the threat of nationalism; and the importance of the turn eastwards. Before the address, sources in the Kremlin said a significant part of the speech would be devoted to national security. Although Mr Putin barely mentioned “defence” or “foreign policy”, his speech was devoted to a new vision of national security. Mr Putin reiterated what he has been saying since the beginning of 2012 – the world is an extremely dangerous place and the situation will only get worse. He said nobody could isolate themselves from what was going on. The external and the internal were inseparably intertwined; one fed the other, creating a turbulent “swirl”. The Kremlin’s foreign and domestic policy was aimed at minimising this turbulence and mitigating risks. In foreign policy, Mr Putin spoke about countering the attempts of those countries that were spreading chaos and knocking out the last remaining pillars of the old system. Russia’s position on Syria was that if you can’t make it better, don’t make it worse. While Russia remains an influential player in Syria, it is one of many and limited in what it can achieve. That’s why the emphasis on the “internal-external” dichotomy, which defines national security, is moving to areas where it has more influence and control. The internal stability of state and society is a guarantee of national security. 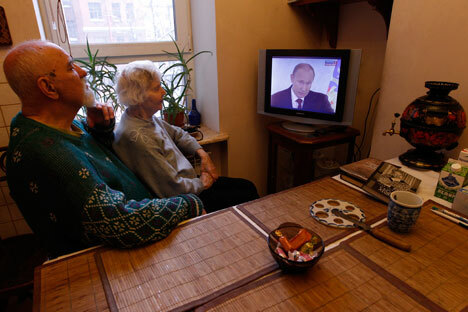 Mr Putin’s address marks a move away from the post-Soviet era. “We must look only ahead and focus only on the future,” he proclaimed. This is an obvious slogan but it marks a significant move away from the laments about Russia’s lost greatness that have defined political thinking for the 20 years since the collapse of the Soviet Union. The debate during the post-Soviet era was about this period: what’s better, the Soviet Union or what replaced it? The thousand-year history of Russia wasn’t even present in the discussion. The government is now looking for a building material for a new historical myth, where debates about Stalin’s role, alongside other events, become just a part of a general internalisation of the national development process. Mr Putin’s message instils hope that Russian society will abandon useless debates about the 20th century. His decision to evoke the First World War for the second time this year was also understandable: “Our predecessors called it the Great War, but it was undeservingly forgotten and struck from our historical memory for political and ideological reasons.” It looks like the celebration of the 200th anniversary of the 1812 Patriotic War will be a harbinger of large-scale events in 2014 to commemorate the First World War. Mr Putin’s emphasis on countering nationalism – manifested during his election campaign and reiterated in his address – suggests the Kremlin is well aware of where the most sensitive nerve is located. The Soviet legacy has run out there, too; internationalism and the presumption of a secular state are no longer taken for granted and need to be defended and reformulated. It is clear to whom Mr Putin’s words about the unacceptability of any manifestations of nationalism and chauvinism are directed. His message that “we will not allow the emergence of closed ethnic enclaves in Russia with their informal jurisdiction, existing outside the country’s common legal and cultural framework, and disdainfully disregarding the accepted standards, laws and regulations” was aimed at Russian nationalists and those trying to form ethnic communities in metropolitan areas. But the Russia-specific principles for establishing this uniform legal and cultural framework are unclear. Russia is ceasing to be an empire but, because of its complex composition, it cannot become an ordinary nation state as other colonial powers did after their collapse. As a result, a future Russia risks combining the worst of both worlds. It is not yet clear whether a model that allows the positive aspects of imperial- and ethnic-based nation-building can be capitalised upon. There is no fitting value framework for it. It is no coincidence that the leitmotif of the address was morality – a notion that Russian leaders very rarely utter, let alone implement in practice. This also represents a break with the late Soviet and post-Soviet eras, each of which, in their own ways, distanced themselves from anything ideal. Romantics with the ideals of the Sixties who initiated perestroika were an exception, but their quick political demise only reinforces the aversion to values. During the many years of reforms, social transformation was mainly perceived in purely economic terms; pragmatism was guaranteed to prevail over any kind of idealism; and an accurate mathematical model was considered more important than adequate value content. Even animated debates about “European values” had a political and even geopolitical dimension, but never a substantial one. Values, it seems, are turning into an ideological concept, although the kind of traditionalism that is emerging right before our eyes doesn’t look like anything that could give impetus to development. That’s why Mr Putin’s messages that “Morality cannot be imposed by law,” and “Attempts by the government to encroach on people’s beliefs and views are a manifestation of totalitarianism… which is completely unacceptable,” are extremely important. At least this is something to evoke when the most zealous champions of morality from inside the State Duma start to impose moral law once again. The return of the notion of values to political vocabulary is progress compared to the arrogant cynicism that had prevailed before. Naturally, the president turned to his pet subject of demographics, reminding the audience again that to be successful in the world “there must be more of us and we must be better”. He considers human resources to be the true basis of sovereignty, more important than all other resource components. Geopolitical relevance means the ability to build different relations with different centres of power in the multipolar world, offering them what they need. This is possible given Russia’s central geopolitical situation – but there are risks. “If a nation is unable to preserve and reproduce itself, if it loses vital points of reference and ideals, it does not need an external enemy because it will fall apart on its own.” This thought could put an end to the debates about the reasons behind the collapse of the USSR that have been raging for 20 years. It has seemed in recent years that the theory of an “enemy plot” is becoming canonical, but perhaps something will change now.